L-cysteine is a conditionally essential amino acid, one of only three sulfur-containing amino acids, the others being taurine (which can be produced from L-cysteine) and L-methionine from which L-cysteine can be produced in the body by a multi-step process. Cysteine plays a role in the sulfation cycle, acting as a sulfur donor in phase II detoxification and as a methyl donor in the conversion of homocysteine to methionine. Cysteine also helps synthesize glutathione, one of the body’s most important natural detoxifiers. 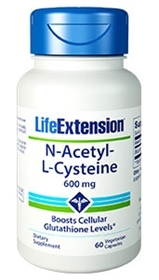 N-acetyl-cysteine is the acetylated form of L-cysteine, which is more efficiently absorbed and used. Glutathione (gamma-L-glutamyl-L-cysteinyl-glycine) is a peptide (short protein)-like molecule synthesized in the body from the three amino acids L-glutamic acid, L-cysteine, and glycine. Glutathione is one of the body’s most important and powerful antioxidants, helping to detoxify xenobiotics. A major function of vitamin C is to keep glutathione in its reduced form so that they can continue to provide free radical quenching effects. Even though many published studies show that garlic, selenium, alpha-lipoic acid, L-cysteine, and N-acetyl-cysteine can boost cellular glutathione levels, people with health problems may benefit from taking high doses of glutathione. The liver is a large glandular organ, whose functions include storage and filtration of blood, secretion of bile, detoxification of various substances, and conversion of sugars into glycogen, which it stores. The liver is also responsible for processing many vitamins and nutrients into a form that can be utilized by the body, and processing many toxic chemicals for elimination. Modern living involves daily exposure to substances that are toxic to our bodies, which imposes a heavy load on the liver. Therefore, a healthy liver is critical to well-being. Certain lifestyle risks and medical conditions make it all the more important to ensure that the liver is being maintained at its functional best. In Europe and Asia, herbal liver tonics have been in common use for centuries. The effectiveness of the herbs used has been validated during the past decades through modern research and clinical studies. These herbs generally contain antioxidants, cell membrane stabilizing agents, bile secretion enhancing compounds, or nutrients that prevent depletion of endogenous antioxidants such as glutathione. Hepato-protection is beneficial not only for the liver, but for the overall health and vitality of our body. N-acetyl cysteine is the more efficiently absorbed and used form of the amino acid, L-cysteine. L-cysteine plays a role in the sulfation cycle, acting as a sulfur donor in phase II detoxification and as a methyl donor in the conversion of homocysteine to methionine. N-acetyl cysteine has antioxidant properties, and helps to maintain healthy levels of the liver’s natural detoxifier, glutathione. In addition, N-acetyl cysteine has been used to break up pulmonary and bronchial mucus. Other ingredients: magnesium stearate, gelatin, water. When taking N-acetyl cysteine it is recommended that two to three times as much vitamin C be taken at the same time. Those who supplement with NAC should drink 6 to 8 glasses of water daily in order to prevent cysteine renal stones. Cysteine renal stones are rare but do occur.